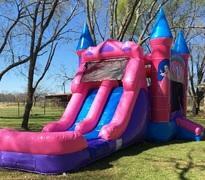 Inflatable Party Magic LLC located in Cleburne, Texas is your Inflatable and Event Rental Specialist for many Texas cities such as Burleson, Crowley, Midlothian, Granbury, Mansfield, Arlington, Benbrook, Fort Worth, and many more. 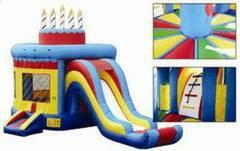 Bounce house combos offer bounce areas with slides, climbing walls, and some even have obstacles. 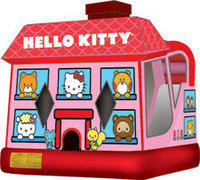 They will keep kids busy and not wanting to stop all day long. 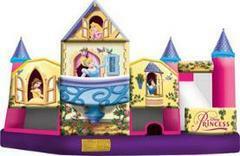 The great thing about the combos is that kids will not get bored since they are challenged at every turn. 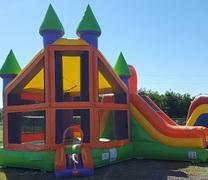 Your kids will get their exercise while having a blast jumping and sliding. 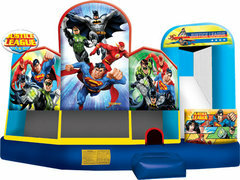 We have a large number of themed and unique bounce house combos to choose from. You can be assured that all of our themed combos are properly licensed for use and can be photographed and shared on social media safely and without worry of any type of copyright infringement. 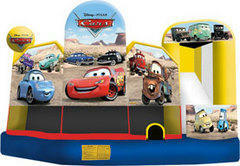 We do not use knock-off inflatables or illegal themes or banners on our inflatables. 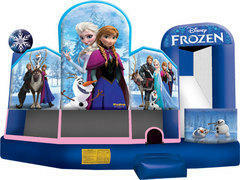 Bounce House combos are great for ages 2 to 12. Don't worry Mom & Dad, you can play with the kids since the top of the age rating is for fun factor only. 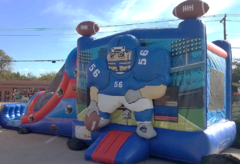 All of our inflatables are commercial and made with high grade vinyl that even teens and adults can play on. With that being said, these combos are not specifically designed for adults and teens and will not provide the fun and enjoyment they will provide for children. 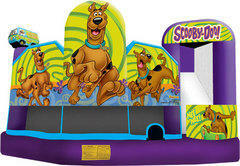 If you are looking for an inflatable to entertain mainly teens and adults, check out our Interactive Inflatables. They offer a challenge for every age level. 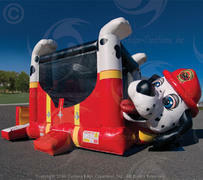 Toddler Bounce House Combos are also considered dry bounce house combos. 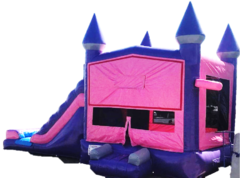 The reason why Toddler bounce combos have become so popular are because they have an open top concept so that toddlers can see the light above them and not feel so closed in. 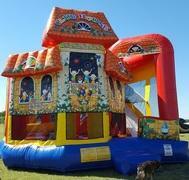 Not to mention, the noise level is completely different since there is not a top and the sound escapes. 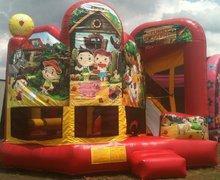 Toddler combos offer bouncing throughout them, but the bouncing space is broken up with interactive popup characters and obstacles throughout the bouncing space. 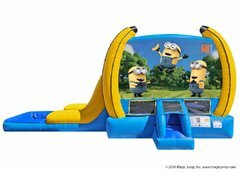 In addition, they will have a small slide and climbing wall that is slightly slanted and positioned in a manner that makes it very easy for a toddler to climb up and slide down without assistance. 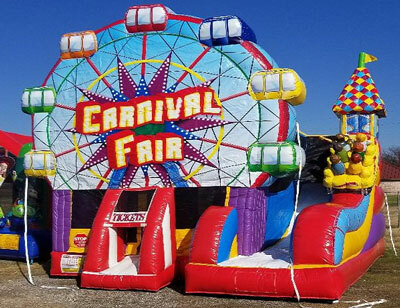 Don't forget to add the tables, chairs, party games, cotton candy machines, popcorn machines, snow cone machines, frozen drink machines, etc. 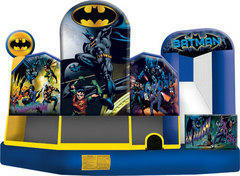 We offer everything you need to make your party a complete success. 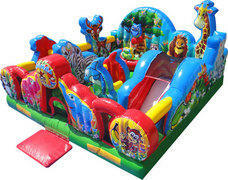 You can add on items or even party packages to complete your party needs with just a click of the button. Party games are very low in cost to add to your order, but add that extra something to occupy the kids and keep them fully entertained. 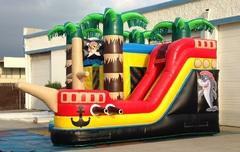 Please note that these units are rented for dry use only and cannot be used as water slides. 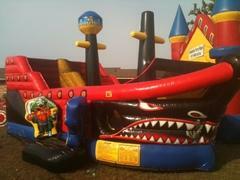 For water slide rentals please see the water slide or wet combo page and rent from that section. 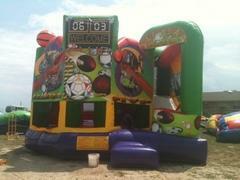 Units rented from this section and used wet will be charged a $100.00 cleaning fee. 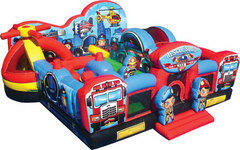 The delivery prices listed are to our standard delivery areas. 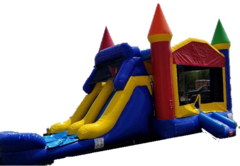 We do service additional areas, those additional delivery prices will be shown in the cart after you enter your zip code. 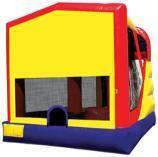 Bounce house combos to be used wet are listed on the Wet Combo Page. Book from there if you want to use your unit wet. 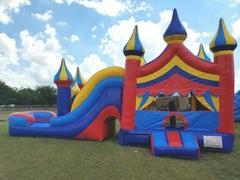 Let Inflatable Party Magic LLC Create the magic and excitement for your child's next birthday party!